Bedřich Smetana is definitely considered the founder of the Czech school, thanks to his symphonic work and his incidental music, marked by a strong patriotic and nationalist trait. He was deeply influenced by the political events which took place in Prague in 1848, after which he became actively involved in the cultural life of his country. Born in 1824 and acclaimed as a violin prodigy at the age of four, during his studies he was introduced to composition for various ensembles and, in 1855, to chamber music. The Trio in G minor marks the beginning of this repertoire and reflects the deep inner crisis experienced by the composer after the death of his beloved daughter, the 4-year-old Bedřiška, who had shown early signs of musical talent. His pain emerges through the form which was already widely used in the European tradition by Mozart and Beethoven – a model for Smetana, steeped in German culture and an admirer, among his contemporaries, of Schumann, Wagner and Liszt. From the latter musician in particular stems the fortune of the Trio op. 15, performed for the first time in 1855 with little success at the Prague seminary by the composer himself on piano, Anton Bennewitz on violin and August Goltermann on cello. It consists of three movements: the first two develop into a funeral atmosphere, a real “poem in memory of an angel”, and seem to use identical thematic material. The Moderato assai, in sonata form, leads almost directly into the Allegro ma non agitato which reiterates the initial theme and thereby makes it tenser and more agitato, thus emphasizing the pathetic and painful character produced by the chromaticism and the use of high tessituras. The two following trios (Alternativo I – Andante and II – Maestoso), with dance traits, apparently ease this atmosphere and the final Presto, with its concerto-like writing, heightens this opening towards positivity and optimism, by starting from the same tragic situation of the previous agitato but passing to the major mode and including some parts of the Molto vivace of a piano sonata composed by the author in his youth. Thanks to the reinterpretation of a traditional form and to the introduction of original contents, skillfully displayed and elaborated, this page – unique in Smetana’s catalogue of compositions for trio ensembles with piano – becomes extremely interesting and fascinating. These same adjectives apply, for other reasons, to the Trio op. 8 in C minor composed by the 16-year-old Dmitrij Dmitrievič Šostakovič in 1923, when still a pupil of the Leningrad Conservatory. For instance, they could refer to the fact that the trio consists in just one single movement, composed in the classical sonata form, and that the three opening notes of the Andante, played by the cello, serve as the Leitmotiv for the entire composition. The work is rhapsodic – despite the cohesion generated by the underlying motif – because of the continuous changes in atmosphere and color caused by the nature of the two fundamental thematic ideas, well-defined yet different from each other: the first one is enunciated with resolution and expressive intensity, whereas the second lyric, with its romance character, is suggestive of Schumann. An unusual development plays on the antinomy of these motivic materials, then the piano leads the reprise into an imposing and riveting coda. The first performance took place on March 20, 1925, in the Small Hall of the Moscow Conservatory, thanks to an exceptional trio formed by pianist Lev Oborin, violinist Fedorov and cellist Egorov, but the first edition did not appear until later, when the manuscript was completed by Boris Tiŝenko. 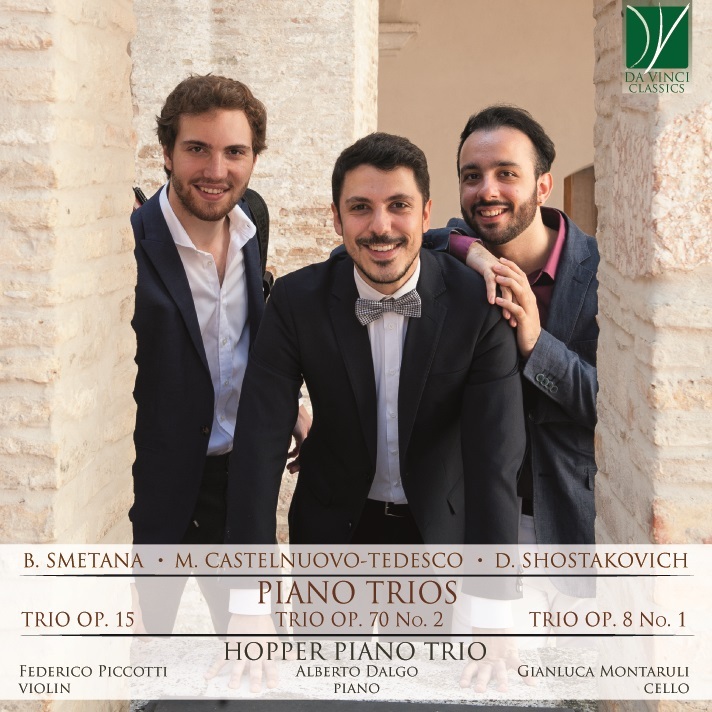 The Trio then slowly began to enter the repertoire of Western performers, who managed to understand its spiritual power and present it as a synthesis between the formal and technical heritage of Beethoven and Brahms and that of the two Russian national schools – one linked to Čajkovskij and the other, more cosmopolitan, to Borodin and Stravinskij, of which Šostakovič adopted the incisive, almost wild fervor. Like his other chamber compositions, and perhaps even more than his symphonic pages, the Trio represents a genuine evidence of his artistic heritage. Mario Castelnuovo Tedesco’s musical production appears to be strongly influenced by the political and social events leading to the Second World War. Not only did the 1938 racial laws force the composer to emigrate to the United States, but they also brought about a significant change in his poetics and in the genres he dealt with. Born in 1895 in Florence, he trained as a pianist at his city’s musical institute and later as a composer at the Liceo Musicale in Bologna. Ildebrando Pizzetti, his mentor in life and studies, introduced him to Italian avant-garde authors: Casella, Malipiero, Respighi, Gui, Carlo Perinello and Tommasini. An active member of the Società Italiana di Musica (later Società Nazionale di Musica Moderna), Castelnuovo had a balanced attitude towards novelties and international avant-garde trends and kept his distance from all forms of fanaticism. He was a composer, a soloist, an accompanist in various ensembles and a music critic. Commenting on the styles and forms of contemporary music, he stated that he did not believe “in modernism or neoclassicism, nor in any -ism”, that he conceived music as a “simple means of expression”, and that he translated all his thoughts in musical terms. This is more evident in some of his orchestral (Bacco in Toscana), vocal (Canzoni shakespeariane) or piano (Piedigrotta, Le danze del re David) compositions, whereas in chamber music he delivered his more ‘committed’ creations, thus arousing interest and recognition among contemporary critics. For instance, the 1932 Trio op. 70 – second composition for this ensemble – was received with particular interest: it revealed his “knowledge of Italian classics and his continuous harmonic and contrapuntal search through melodic settings and the rhythmic and expressive interplay of the parts” in a cohesive atmosphere. Particularly appreciated was the second movement (Romanza con variazioni), both for the quality of the selected theme and for the kind of variations arising from the “intimate need to paraphrase and strengthen” the initial motif. Even the final tempo confirmed the modernity of his writing and his mastery of form (Mario Saint-Cyr on the “Rassegna Dorica”, 1932). This same judgment is still valid today, but can be further elaborated through a comparison with contemporary repertoire, which reveals that the author’s stylistic code springs from Pizzetti’s contrapuntal heritage but is affected by Debussy’s impressionism and Ravel’s neoclassicism. Intense harmonic effects, clarity and formal elegance inserted in traditional forms complete the portrait of his first creative phase. After arriving in the United States in 1939 and becoming an American citizen in 1946, Castelnuovo Tedesco adopted a new, neo-romantic and programmatic way of composing, which brought him much closer to symphonic music, but also prompted him to devote himself to film music and to the guitar repertoire. Until his death in 1968, he taught at the Los Angeles Conservatory of Music (later the California Institute of the Arts). Federico Piccotti was born in Rome in 1996 and started learning the violin at the age of 5. He graduated at the Santa Cecilia Conservatory of Music in Rome. In July 2017 he finished a Violin Master in Performance at the Guildhall School of Music & Drama in London with David Takeno . Now he is studying with Pavel Berman at the “Conservatorio della Svizzera Italiana”. He was awarded in several competitions throughout Italy, UK and Spain, both as a soloist and in chamber music. Federico took part in Masterclasses with Zakhar Bron, Pavel Vernikov, Ilya Grubert, Harald Herzl, Igor Volochine, Dora Schwarzberg, Roberto Gonza lez-Monjas. He has performed in the renowned Antoni Gaudi’s building “La Pedrera” in Barcelona, for the Festival of the “Camerata Musicale Barese” in Bari and at the Wigmore Hall in London. In 2015he won the audition to play with the Gustav Mahler Symphon y Orchestra and he also played with the London Symphony Orchestra under the baton of Valery Gergiev and Sir Simon Rattle. Gianluca Montaruli graduated with honors at the Umberto Giordano Conservatory in Foggia. He began his studies under the guidance of his father Francesco improved with Luigi Piovano, Massimo Polidori and in 2015 Was chosen by Antonio Menes to enter into his class at Walter Stauffer Academy in Cremona. Highly regarded for his musical talent, result winner of several international competitions: winner of “ Premio Crescendo” in Florence, finalist with honor mention at “Janigro International Competition under 20” in Poreč, winner of 1st prize at “Grand prize Virtuoso” in London, 1st prize at “eMuse International Competition” in Athens, winner of scholarship of “Teatro Olimpico” in Vicenza. As a soloist he debuted at the Royal Albert Hall in london, Byzantine Museum of Athens, NedPho-koepel in Amsterdam working with Giovanni Sollima, Organ Hall in Chisinau with Orchestra Nationala De Camera Moldova, Pazardzhik Theatre in Sofia. Currently he studies with Giovanni Sollima at “Accademia Nazionale di Santa Cecilia” and at Universität Mozarteum in Salzburg with Giovanni Gnocchi. Alberto Dalgo attended the triennial course at the Imola International Piano Academy as a pupil of Maestro Leonid Margarius, and earned a Master’s Degree with honours under the tuition of Maestro Andrea Turini at the Pavia Conservatoire. He took part in various international piano competitions, where he always received high praise for his performances, such as the first prize and Grand Prix at the Concours Musical de France, the first prize at the Bellagio International Piano Competition, and others. He performed in prestigious venues in Italy, including Società dei Concerti di Milano, Teatro Verdi in Salerno, Teatro Filodrammatici in Cremona, Società Filarmonica in Trento, Teatro Edi and Castello Sforzesco in Milan, and several International Festivals. He held solo recitals at the Ateneo de Madrid, at the Robinson College in Cambridge, at the Berlioz Auditorium in Paris, at the Eutherpe Hall in Lèon, at the Galiffet Palace in Paris, at the Italian Institut of Culture in Oslo. Bedřich Smetana: (b Litomyšl, 2 March 1824; d Prague, 12 May 1884). Czech composer, conductor and critic. The first Czech nationalist composer and the most important of the new generation of Czech opera composers writing from the 1860s. His eight operas established a canon of Czech operas to serve as models for Czech nationalist opera and have remained in the Czech repertory ever since. Such was the force of his musical personality that his musical style became synonymous with Czech nationalist style, his name a rallying point for the polemics which were to continue in Czech musical life into the next century. Mario Castelnuovo-Tedesco (b Florence, 3 April 1895; d Beverly Hills, CA, 16 March 1968). Italian composer, pianist and writer on music.